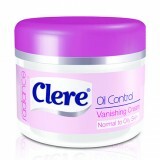 Clere Radiance is a new skincare range developed by trusted South African brand, Clere. Aimed at addressing the primary skincare issues that many South African women experience, the 3-in-1 range focuses on oil control and even tone skin. Enriched with a specially formulated Super Fruit Serum, Clere Radiance products provide anti-oxidant properties to help protect the skin. These anti-oxidants also limit the production of free radicals, which cause inflammation and premature ageing. The range consists of an Oil Control Beauty Bar, Oil Control Toner, Vanishing Creams and an Even Tone Complexion Cream.